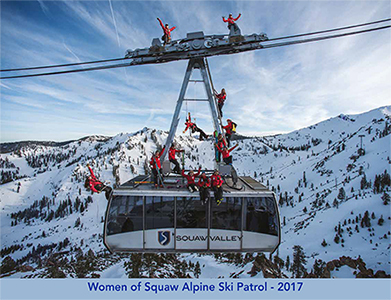 Gallery Keoki announces the new Women of Ski Patrol 2017 Calendar, showcasing the thirteen female patrollers from the Squaw Valley and Alpine Meadows Ski Patrol Teams from the 2015-16 winter season. All proceeds will help fund avalanche safety education scholarships. in the Village at Squaw Valley. 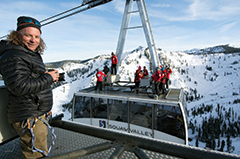 For more information about applying for avalanche education scholarships, please go to www.squawalpine.com/womenofpatrol. Translating timeless moments in mountain light is my passion. and, as is so often the case, this wonderful soul project found me. I jumped at the chance, shooting almost fifteen thousand frames of these astonishing women at work. Sharing this experience is yet another testimonial to why our mountain life is sacred to us. Beyond ensuring our mountain is safe and saving lives, our ski patrollers endure Mother Nature’s challenges, keep it real and personify power and commitment. Theirs is a labor of love and an example to inspire us all to live deeply now.